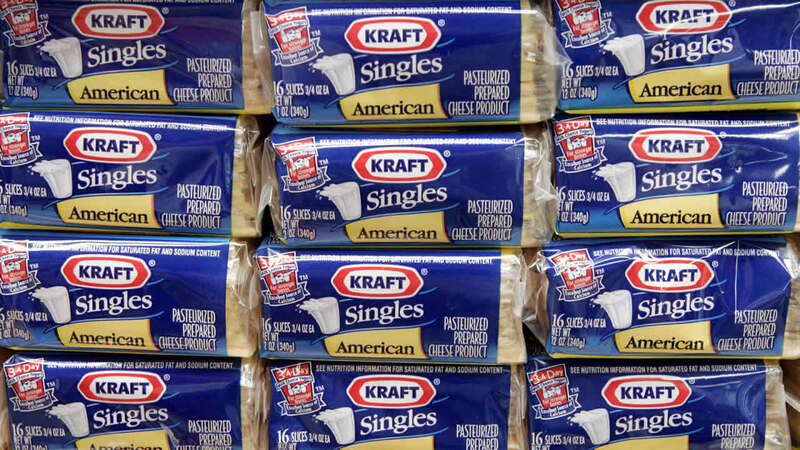 The Kraft Heinz Company says it is voluntarily recalling select code dates and manufacturing codes of Kraft Singles individually-wrapped slices due to a potential choking hazard. The company cited the possibility that a thin strip of the individual packaging film may remain adhered to the slice after the wrapper has been removed, causing the possible hazard. There have been 10 consumer complaints to date about the packaging, including three reports of consumers choking, the company said. Approximately 36,000 cases of the recalled product were shipped by Kraft Heinz to retailers in the U.S., Puerto Rico and Grand Cayman. Kraft Heinz did not ship this product to Canada or anywhere other than the U.S., Puerto Rico and Grand Cayman. The S54 and S55 codes refer to the two production lines on which the impacted product was made. The Best When Used By Date and Manufacturing Code are stamped on both the larger 3-lb. and 4-lb. boxes and the enclosed individual 1-lb. packages. No other sizes, varieties or code dates are included in this recall. And no products with manufacturing codes other than "S54" and "S55" after the code date are included in this recall. Consumers who purchased this product should not eat it, but should return it to the store where purchased for an exchange or full refund. Consumers in the U.S. and Puerto Rico can also contact Kraft Heinz Consumer Relations for a full refund, at 1-800-432-3101, Monday through Friday, 9am to 6pm Eastern.